The real question is whether it's as great as the mania suggests. After spending three days with the 4.7-inch iPhone 6, I do love the iPhone 6. While I really like the larger screen — my iPhone 4 was too small — it's the little things that make the bigger iPhone 6 a real star. The screen is brilliant and bright, moreso than Apple's previous iPhones, whose images were crisp and true but a bit subdued. In the iPhone 6, Apple has increased brightness without making the colors artificially garish, in that unnatural, pumped-up "Miami Vice" style that Samsung favors. It works great for navigation while driving with the new Siri hands-free mode (yes, Apple Maps is a lot better now). The other big internal change is support for NFC (near-field communications) that will enable contactless mobile payments in the forthcoming Apple Pay service. Apple Pay doesn't work yet — an iOS 8 update planned for October is required, as are Apple Pay-compatible sales terminals in stores — so I could not test it. NFC may have other uses in the future, but for now Apple is tying it to Apple Pay to ensure security. Apple moved the Sleep/Wake switch from the top of the iPhone to the right side, so you can reach it with your thumb when holding the device. But it means you can't quickly dismiss an incoming call during a meeting by double-pressing the button in your shirt pocket — you have to pull the phone out of your pocket to dismiss the call. I've found no alternative quick-dismiss method on the iPhone 6 for those of us who carry our phones in our shirt pockets. Apple should add a timed option for Do No Disturb so that we can silence the phone in a meeting but not leave it silenced through forgetting to turn it back on, as is now required. Apple did not move the audio jack to the top of the phone, where it's more convenient when carrying your iPhone in your shirt pocket (and where the iPhone 4 series had it, though not the iPhone 5 series). To listen to music while on the train or walking down the street, you have to put the iPhone in your pocket upside down to connect your earbuds — which exposes the speaker and Lightning openings to the outside elements. OK, the goal is to avoid the lint in the bottom of our pockets -- still. The image below compares the screen sizes; click it to get a full-size version in a new window. The progression of iPhone screen sizes, from left to right: iPhone 4s, iPhone 5s, iPhone 6 in Zoomed view, and iPhone 6 in Standard view. Widgets now can live in the Notification Center. The revamped Notification Center has a separate pane, called Today, for widgets. It shows a summary of the current weather and your day's calendar. To that you can add more widgets; scroll to the bottom of the screen and tap Edit to add or remove them. All apps that have widgets — dozens already do, from Evernote to Dropbox — automatically add those widgets to this screen. A lot of widgets are just quick launchers for their apps, but a few are actually useful, such as those for Yahoo Weather and iTranslate. The Notification Center's Today screen is where widgets can be added to or removed from. Keyboards go crazy. Speaking of widgets, iOS 8 also supports extensions, which lets apps interact directly under iOS's supervision. The Box and Dropbox cloud services now have extensions, so app developers can more easily enable direct file access to their services, for example. But the early extensions are mainly alternative keyboards. I don't get the obsession some folks have over custom keyboards, but — what the hey — now you can get them. iOS 8 also offers the QuickType feature that suggests words above the keyboard as you type, so you can select the one you mean before typing it out. It's a feature you'll love or hate, because it can be as distracting as it is helpful. (To disable it, set the Predictive switch to Off in the Keyboards section of the Settings app's General pane.) Here's a tip: You can temporarily hide the QuickType bar by dragging it down, then drag it back up when you want it again — rather than disabling it. The Handoff feature is subtler than you might think. The big foundational new capability is iOS 8's Handoff, enabled by default in the Settings app's General pane. I love the idea of Handoff, which lets you start an activity on one device and pick up where you left off on another — a key enabler of the emerging trend I call liquid computing. 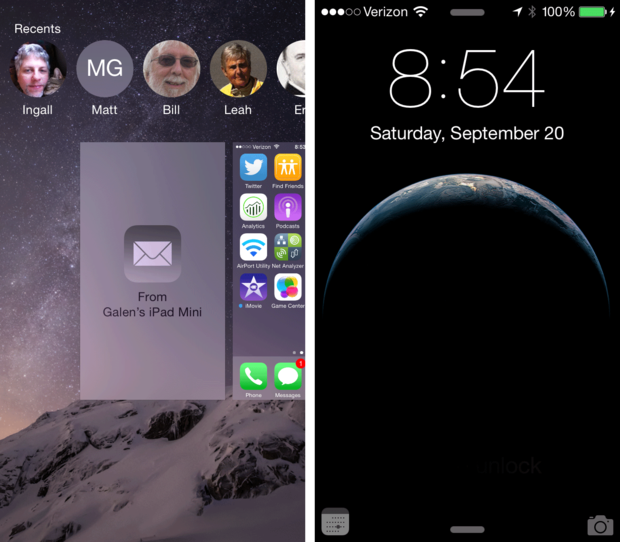 iOS 8's Handoff feature shows apps available for handing off their activity in the left side of the App Switcher (left) and the bottom left of the lock screen (right). 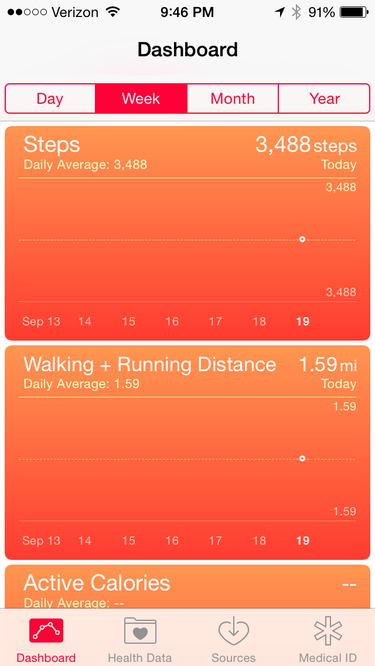 The iPhone's new Health app can track your activity from the phone itself. The iPhone 6 is more than a larger iPhone, but a better iPhone. The hardware is top-notch, the user interface beautifully designed, and the OS and app capabilities are both powerful and thoughtfully built. The Zoomed views mode makes the big screen work well for the middle-aged, while younger users can stick with Standard view. Once you understand how it works, the Handoff feature becomes a major convenience as you move among devices. The Health app's monitoring makes the M8 motion coprocessor suddenly useful in a clear way. The privacy, security, and management controls are collectively second to none. The 5-5-inch screen makes for one gargantuan smartphone -- too big for its own good?